There is a strange truth about going to hiking trips. There are WAY too many people who think that they should not invest in backpacks. You will be going to outdoor hiking or camping trip once or twice a year, so why bother buying the most expensive backpack out there? They say if I will spend only couple of hours hiking and will be going not so long distance, I don’t need the best hiking backpack. If your backpack is heavy and bulky, even if you are walking only for 20 minutes to the mall, there will be lots of pressure to your back and neck. Any type of walking will feel like hell. But if you really want to enjoy your hiking trip, you need to make your stuff lighter. The truth is, you need a systematic approach in order to choose the most lightweight gear as possible. Everything needs to be as light as possible, including shelter, sleeping bag, and clothes. So your backpack is the first thing to start reducing the overall weight. Here is the list of most lightweight and high quality backpacks that we found very useful in hiking trips. You can still carry a lot of stuff in those backpacks and you won’t feel the pressure and weight. We have collected internal frame backpacks dividing it to two groups: larger ones and smaller ones. Large backpacks are ideal for experienced hikers who go over for 6 days or more trips and who need to carry lots of stuff with them. It is great for mountain climbers, trekkers of high distances and expedition workers. Osprey Atmos 65 AG Backpack is one of the best backpacks out there. It has won a number of awards for its comfort, high quality and stability. It is one of the most popular backpacks among heavy backpackers. And it is a very good choice for hiking. The backpack features Anti-Gravity suspension system, breathable ventilated materials on a back, adjustable harness, compression straps, dual zippered front panel pockets and a removable floating top lid. This suspension system covers your back from 365 degrees spreading the load evenly to all of your body. Because it is made of high quality materials, it is water resistant and does not wear off quickly. Also, the backpack provides a lot of flexibility with its compression straps. It is connected directly to the frame. As a result you can squeeze down to make the bag smaller if you are not carrying a lot of stuff. As a bonus, the backpack offers removable sleeping pad straps, stow-on-the-go trekking pole attachment and a tool attachment. It has one big internal compartment and front zippered pockets. There is an internal reservoir sleeve in the main compartment for storing your water. There is no doubt that Gregory Baltoro 75 Backpack is one of the best backpacks available out there. It also has won lots of awards from backpacking magazines last year. One of the notable features of the backpack is its Response A3 suspension system which due to its construction makes heavy stuff feel noticably light. It offers lots of backpack sizes S, L, XL depending on your height. You need to measure your back and select the right size. After that, you can go to wonderful adventures with this backpack. The backpack has a main compartment and front pocket, two zip side pockets and dual waistbelt pockets. There is a top lid which can be removed when not needed. Apart from that, there is a special place to store our sleeping bag under the front pocket. There is also a hydration sleeve in the main compartment. TETON Sports Scout 3400 is one of the best backpacks for its price. It is cost effective and yet made of good materials. If you are looking for a smaller bag for short day trips, this bag will be ideal. The backpack has one big mesh storage pocket as a main compartment with hydration sleeve inside. The main compartment can be accessed both through top of the bag and through front. It has a couple of additional zippered pockets on the front side, both for keeping sleeping bag and your electronics. The hip straps are also equipped with smaller pockets. On the bottom of the backpack, you can store the rain cover and sleeping bag. Both the shoulder straps and hip straps are adjustable to your height. While the backpack does not offer special bags for women, its shoulder straps can be adjusted for women’s body too, with chest straps. As for the suspension system, it uses a lightweight aluminum material inside the internal frame. The bag is adjustable to any size. Shoulder straps adjust to any size needed. You can adjust based on your height. You can also adjust hip straps. The bag is made of cheaper materials to reduce overall cost, but that doesn’t affect quality and durability. However some parts may get ripped of if you are using the backpack not carefully and if you are loading it with more weight than it is expected. Overall, it is a budget version of the modern hiking backpacks. It is good for short trips and for carrying less amount of gear. 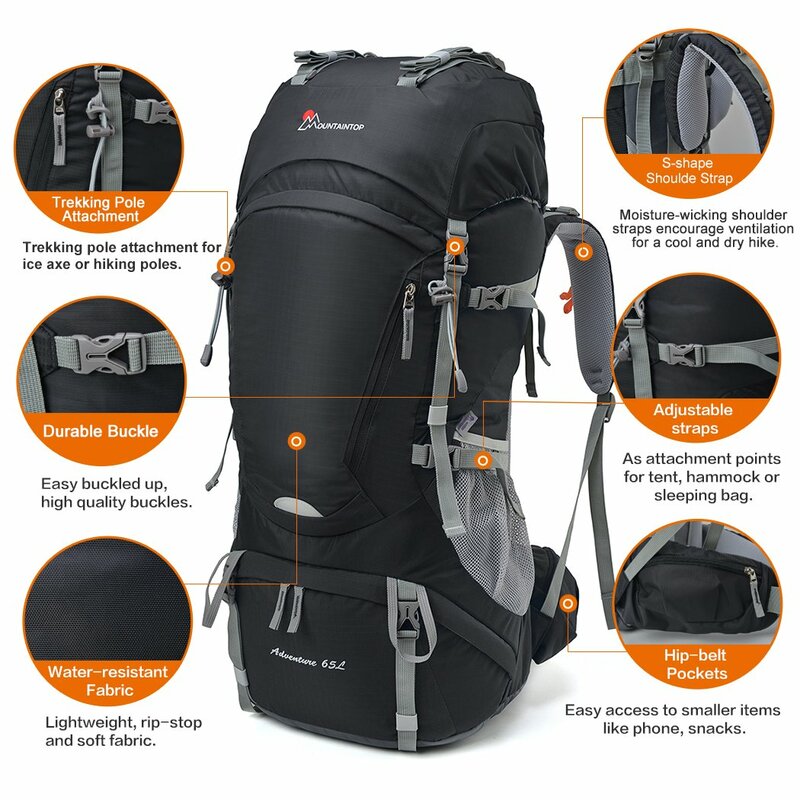 Mountaintop has recently introduced 65 L hiking backpack with an internal frame. The backpack is made of high quality materials, and although it is very cost effective, the quality has not been sacrificed. It has one main big compartment with hydration sleeve inside and lots of zippered compartments on the front and on sides. There is a zippered compartment at the bottom for storing a sleeping bag and other stuff, as it has a zippered divider. Side pockets and hip pockets make it easy to store quick access items such as snacks and mobile phone. Overall, there are 2 hip-belt pockets, 2 lid pockets, 1 bladder sleeve, 1 front pocket, 1 rain cover (included) compartment and two mesh bottle pouches. Overall, there are 8 compression straps on the front of the backpack which can be used for compressing the backpack or for hanging lots of stuff. The torso can be adjusted to your height with 8 stage height adjuster system. The backpack comes with a rain cover. The main advantage of this backpack is that it fits taller people over 6′ too. Overall, it is a nice bag for the price. Terra 65 backpack is a simple hiking backpack with lots of good features and good quality. At first, it seems like it is no different than any other hiking backpacks out there. But the bag stands out with its stable suspension system, flexible organization of pockets, and durable materials. The backpack contains main compartment and a compartment for a sleeping bag at the bottom. The main compartment and a compartment for a sleeping bag can be joined together by removing a fabric that separates them. Front pocket zippers from both left and right sides. The main compartment can be accessed from top, from the bottom and from right side. There are overall 8 pockets on the sides and on a hip strap. The backpack is made of combination of 600D polyester, 420D mini-ripstop nylon and 1200D polyester materials. The shoulder strap, the back and hip straps are also equipped with soft air mesh and padded cotton material to improve the ventilation. The backpack uses Optifit suspension system which allows you to adjust the backpack to your own torso length. The backpack fits torso sizes from 15″(38cm) to 22″ (56 cm). One of the notable features is that the hydration sleeve offers far more capacity – 3 liters which is large comparing to other backpacks. Overall, it is one of the best backpacks for its price. We have provided the list of backpacks of larger volume. Below you will see best backpacks for hiking, trekking or backpacking with less volume. They require less space for storage and they do not have a special compartment for a sleeping bag. The maximum weight that can be loaded in these backpacks is 18 kg. Granite gear Lutsen 45 Backpack is one of the lightest backpacks out there. It only weighs 1.4 kg (3lb) when empty. Other backpacks of the same size weigh about 2 kgs (4.4lb). It is made of combination of different light weight materials of nylon cordura with a maximum density of 210 denier. There is a thin mesh quick drying fabric on the shoulder straps and on the harness. The materials are treated with DWR water repellent composition barrier. Lutsen Re-Fit suspension system is made of soft, ergonomic and ventilated backrest that can be adjusted accurately in height and in width to suit individual needs. The frame is made of polymer and can bear weight up to 18 kg. Lutsen 45 Backpack has a main compartment and a completely removable top. There is a hydration pack in the main compartment. The front pocket and side pockets are made of fully expandable soft materials. There are flexible pockets on hip straps. Osprey Exos 48 Backpack is probably the most lightweight backpack for hiking over there. It weighs just 1.13 kg (2 lbs, 8 oz) and has all the features of big backpacks: suspension system, weight distribution, exceptional ventilation on a back. One of the notable features of Osprey Exos 48 Backpack is ventilated back made of soft foam. The backpack is made of silicone and polyurethane coated with water resistant mini rip-stop nylon. The suspension system is made of Aluminum frame covered with soft EVA foam and HDPE framesheet. Most lightweight backpacks sacrifice number of storage compartments and use cheap materials. But it is not the case with Osprey Exos 48. The top removable lid provides a huge space for storing additional gear. Main compartment is spacey enough to fit most of your gear and there are expandable mesh stretch pockets on the front and on sides. Although, the compression straps are really narrow, they do a great job of compressing your stuff. It has lots of holes for holding your additional gear. The hip belt contains soft expandable pockets for your cameras, phones and snacks. However, beware that the backpack has different sizes for different torso length. It is not adjustable. Overall, Osprey Axos 48 is a good backpack and if you are a minimalist backpacker, this is what you need. Deuter ACT Trail Pro is one of the technical light backpacks for those who go backpacking in short 2-3 day trips. It his relatively new backpack in the market. It has very comfortable suspension system and has a front access to main compartment. The ACT Trail Pro has a main compartment, side pcokets and a special two way access to the main compartment through zippers on the front. There are zippered pockets on a hip strap for storing smaller stuff. The backpack itself is made of micro-ripstop nylon material. The harness and shoulder straps are additionally covered with highly breathable 3D AirMesh lining. ACT Trail Pro is made with Aircontact Trail System. The suspension system uses the breathable hollow-chamber foam pads that allows the weight to sit close to the back and close to the centre of gravity. It stabilizes the load evenly covering all over your back. You need to choose our own size depending on your torso length and go with it. ACT Trail Pro includes handful of additional features including a special storage for rain cover. There is a special compartment for your wet clothes. The backpacks contains ice axe and hiking pole loops. The special SOS label makes the ACT Trail Pro useful. Gossamer Gear is relatively new lightweight backpack(from 2015 release) for minimalist backpacking and hiking trips. The backpack comes in four sizes depending on your torso length. Gossamer Gear Gorilla 40 backpack is made of custom 100 denier Robic ripstop nylon material. The harness is covered with additional air mesh fabric for lining. The bag comes with a very large and adjustable mesh front pocket, two side pockets and a lid. While the Gossamer Gear Gorilla Backpack is technically frameless, and it carries the same weight as the backpacks with frame. It balances weight with ultralight aluminum stay on the top, which does not add extra weight and still provides the benefits of internal frame backpacks. The backpack is equipped with a soft pad on the back. You can use it as a sit pad or as an additional unit for your sleeping bag. The Gossamer Gear Gorilla comes with hip belt in different sizes, independent of the torso length of the pack. It adds extra flexibility for those who are very tall and skinny or for those who are short in height and have a wide hips. The shoulder straps are narrowed down for more universal use. Select use of 200 denier Robic nylon for reinforcement. ZPacks Arc Blast is the most lightweight backpack which weighs just 21.0 ounces (595 grams). It is a perfect backpack for minimalist and ultralight backpackers. The backpack stands out with its simplicity, ease of use and durability. You can carry more weight than expected, and it will still be strong and steady. The backpack is made of minimal carbon fiber frame. The frame is curved which leaves a lot of airflow to your back. The frame pieces and mesh back panel can be easily removed or replaced. The Arc Blast backpack is made of Cuben fiber. Front pockets and side pockets are made of elastic mesh material. The shoulder straps are adjustable to your torso length. The hip belt is large in width and it is also adjustable to your width. The belt is removable and interchangeable allowing you maximum flexibility when you need. The belt is attached right at the bottom of the frame, allowing it to transfer weight to your hips and shoulders as evenly as possible. The belt pockets are sold separately. The main compartment can be accessed through a roll top Velcro opening. The bag does not contain too much unnecessary straps. It only contains top strap and side straps which allows you to squeeze the bag to the right size when you are not carrying a lot of weight. The design of the backpack allows you to carry your hydration reservoir. It is just above/between the shoulder straps and it has a triangular cover to keep out water. Overall it is a good backpack for light trips. However, do not overload the backpack and treat it with care.